There is barely a week left for Datawind to supply 1 lakh units of the Aakash 2 tablet, but the company has already come out and stated that the next iteration of the Aakash lineup will be launched sometime around mid-2013. Datawind's official website states that the Aakash 3 is expected to be launched in mid-2013. 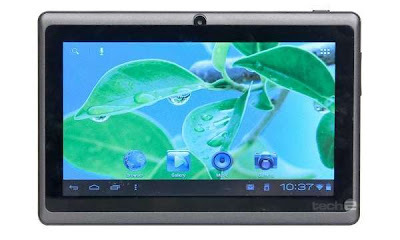 In fact, the Canada-based vendor expects the specifications of the new tablet to be finalised by the end of this month by the National Mission for Education through Information Communication Technology (NMEICT). Datawind's recommendations for the specifications of the Aakash 3 include an embedded cellular modem that will enable it to accommodate a regular SIM card and offer Internet connectivity. The company went on to reveal that its new tablet, the UbiSlate 7C+, was based on the recommended specifications for the Aakash 3. As per Datawind, the recommended specifications include a Cortex A8 CPU clocked at 1GHz, 512MB of RAM, 4GB storage, a multi-touch capacitive screen, a front-facing VGA camera, Wi-Fi and GPRS. Deepak B Phatak, committee member and a professor in IIT Bombay's Department of Computer Science and Engineering, was quoted in the media as saying the Aakash 3 would come with "a faster processor, support both Linux and Android operating systems and have advanced memory." He also said the global tender for the tablet would be floated in February, and as many as 50 lakh units would be rolled out in the next phase. He was quoted as saying, "Our aim is to imbibe the usage of tablets in the education system and create an ecosystem for this. We have distributed Aakash tablets to 250 colleges across the country and asked them to come up with newer ways to use the device." Phatak, together with Prof Ashok Jhunjhunwala of IIT Madras, will be leading the design of the new tablet, accompanied by hundreds of students and partners. The third iteration of the "poor man's tablet" is expected to have a larger distribution and servicing system to enable users to get their tablets repaired locally. Phatak suggested two models for the upcoming tablet: one for schools and the one for colleges. He added that the option for school students could be made available for Rs 2,236, while the one for college students would be priced a little higher. However, it looks like Datawind will miss its supply deadline for the second time in a row. The company is expected to supply 1 lakh units of the Aakash 2 by March 31, 2013, but it recently updated the tablet's delivery status to IIT Bombay, following reports hinting at a delay in supplies. According to the company, as of last week 17,100 devices have been delivered to IIT Bombay and paid for, and as many as 29,400 units of the Aakash 2 are in transit to IIT Bombay through their logistics company and should be delivered in the next few days. Another 23,500 devices have been manufactured and are with sub-contract manufacturers, pending shipment once the company clears the payment for the 29,400 units. Datawind claims the delay was caused by the verification process the Customs had to conduct on the Exemption Certificates for certain components issued by IIT Bombay. As for the remaining 30,000 units, Datawind has confirmed that the motherboards, touchscreens and all other components have been manufactured and the final assembly is being completed. It expects to meet the 1-lakh-unit target within the next couple of weeks, and says efforts are being made to deliver as many as possible by March 31, 2013.